I was first introduced to Skippy Lightfoot in early 2002 when my brother Christopher gave me a 13 page screenplay to read that he had written. I loved it! Immediately, I connected with the concept of a guy that is having a string of bad days, one after the other, and then suddenly is given the opportunity to make one wish. He wishes for a “perfect” day. A day where nothing can go wrong. 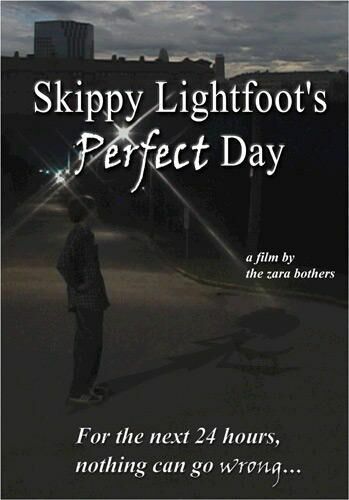 In April of that year we started shooting the script as a short film which was called, Skippy Lightfoot’s Perfect Day, with Christopher and me playing central characters. In our novice days and with no budget at all, we didn’t think to get professionals. I learned later that it’s probably best to have actual actors in your films, but we did our best. I shot the beginning of the film in black and white, and once Skippy’s perfect day begins the film becomes color, à la The Wizard of Oz. The short film had a fun, campy kind of quality to it. It went on to play at a couple of small festivals, which was fun for Christopher and me to attend since we were fairly new to the indie film world. I’m not really sure when the decision was made to expand “Skippy” into a feature film but by late 2004 Christopher had written a feature length version of the script. For a few months I would read what he had written, we would discuss it and make changes while simultaneously, I was trying to pull resources together to make the film. I had the late Ralph Clemente and Valencia College on board to help produce and attorney James Hetz standing by for any contractual needs. Now all I needed was money. I knew if I could attach a known actor to the project, it would give me a better chance of getting some money together. So I went on a Skippy Lightfoot search. My ideal candidate would be someone that was on the way up in his career, but not too hot that he wouldn’t be interested in a small indie film. And of course he needed to look like a good Skippy, hopefully, tall, slim, in his late 20s or 30s. There was an actor I saw in an Ebay commercial that looked perfect, but how do you find someone in a commercial? 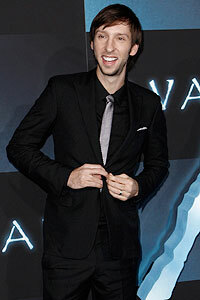 Then one day, when I was watching the Ben Stiller, Vince Vaughn film, Dodgeball, there he was, Joel David Moore, he had a name. That’s my Skippy! After few searches on the Internet, I found a website for Joel with pictures and videos of his work. I contacted some people he had worked with and got an email address for him. I emailed Joel and told him about the idea for the screenplay; he got back to me pretty quickly and asked me to send along the script. Some emails and phone calls followed and Joel was on board. I was now developing the film with Joel attached. As time rolled on, trying to raise the kind of money that I needed proved to be nearly impossible. One day Joel contacted me and told me about some contacts he had with a production company called Sodium Entertainment in L.A. Joel asked if I would consider giving up the rights to “Skippy” and option it to Sodium Entertainment. An option on a screenplay is a temporary hold on a script as it moves through the development and funding stages. It broke my heart to hand over the script and give up my chance to direct it, but I knew that this was the best option to move the project forward. My brother Christopher agreed, so we signed what would become the first in several options for Skippy Lightfoot’s Perfect Day. Sodium had the rights to the script for a year and was unable to get the project off the ground. Then Joel’s production company optioned the script and gave it a try for a while. They had a few named actors involved at one time or another, but then Joel’s career started to take off and once he landed a part in James Cameron’s, Avatar, he wasn’t able to devote any time to the project. That is when the rights to the script came back to Christopher and me. After making some changes to the script, we set it aside. We said, “One day we’ll get this moving again.” That was in 2008. Fast forward to June, 2015, I just had the first screening for my first narrative feature film as writer and director called, Read Me. I was on a plane flying to Portland, Oregon on a work trip. Figuring I had some time to kill on the long flight, and also wondering what my next project might be, I went and found the last version of the Skippy Lightfoot script and read it on the plane. It was a lot of fun to revisit Skippy after all these years. Remembering that Joel Moore was originally from Portland, I sent him a text message when I returned from my trip to say hello, and to let him know how much I enjoyed his city. It took him a few days to respond. Then he sent me this message, “Hey bud! Sorry, directing a film, long hours. How are you? I just got a call from a producer about the rights to Skippy. Can I send your number?” The funny thing was, I had also gotten an email just the day before from Tim Jackson, the same producer Joel mentioned. Tim and I had already talked on the phone and I was sending him the latest version of the script. I didn’t even have to go hunting for it, because I dug it up a couple of weeks earlier to bring with me on my trip. This was a script I hadn’t thought of in over 7 years, but just happen to read the week before. Tim was involved in the development stages of Skippy years earlier. Although the project did not move forward at that time, he said he never forgot about the script. So here we are in the summer of 2015 and my brother Christopher and I have just signed another option for Skippy Lightfoot’s Perfect Day, this time with Category One Entertainment Group. These projects can take a lot of time to develop and even after months or years of work, there is still no guarantee that this most recent option will bring Skippy to the screen. However, it doesn’t matter either way; you put things out into the world, let them go and hope for the best. Of course I would love to see this film get produced some time in the future, but that’s not today. And we don’t live in the future, we live today. If there is one thing I’ve learned from old Skippy Lightfoot, you have to live for today. Because today is a perfect day. Very happy for you Fred and Chris – and proud too.